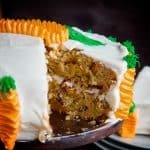 This semi-homemade Easy Carrot Cake Recipe is the recipe everyone will be begging you for. I have fooled everyone with this cake… it’s tastes 100% homemade, but I use a time saving (and flavor adding) trick… find out what secret ingredient I use to add depth and richness to my cake! Prepare (butter and flour, spray with pan release, or use GOOP) two 8-inch round cake pans. In the bowl of a stand mixer, add all the ingredients and beat at low speed just until everything is just incorporated, then increase the speed to medium and beat for another 2 minutes. Divide the batter into the two prepared pans and place in the oven for 35-40 minutes. Test the cakes at 30 minutes; if a toothpick comes out clean, the cakes are done.